Last night, we had something on the tour that sure doesn’t happen every day: A Johnny Depp sighting. 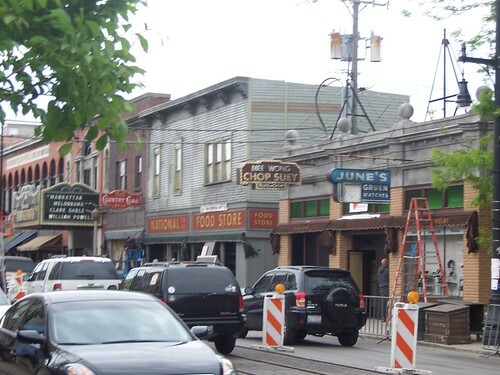 One of the blocks down which we often travel (Lincoln Avenue, near Halsted) has been rebuilt to look about as it did in 1934 for the filming of Public Enemies, a movie about John Dillinger, who was shot and killed on the block in the alley near the Biograph Theatre. I wasn’t on the tour last night, but apparently the bus went by and got a brief glimpse of filming in the infamous alley. See our whole set of set pictures on flicker!